This first ever authorised portrait of the Tottenham, Arsenal and England legend should be fascinating. Racism, homophobia, the Judas switch across North London, the Notts County debacle – it’s a story that has it all. 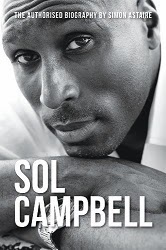 Despite his high-profile career, Sol remains a quiet, sensitive enigma – I’m hoping for a Philippe Auclair-style character study. Goldblatt follows up his mammoth global history, The Ball is Round, with a more pared-down look at his homeland over the last two decades. The spectacular rise of the Premier League is explained within the social context of post-Thatcherite Britain – Penguin call it ‘a must-read for the thinking football fan’. Originally published in Italian last year as Penso Quindi Gioco (I Think, Therefore I Play), the Italian maestro’s story is about to reach a worldwide audience. ‘The Architect’ has won it all: 2 Champions League medals, 4 Scudetto titles, a Coppa Italia and a World Cup. He’s the ultimate creative thinker on the pitch and, if the snippets that BackPage have released in their brilliant #PirloThursday tweets are anything to go by, he’s no different off it. Before the Euro 1992 winners, there was ‘Danish Dynamite’, the hip, Hummel-clad, Michael Laudrup-led side who rose from international obscurity to become everyone’s second favourite team thanks to their exciting performances at Euro 1984 and World Cup 1986. Told for the first time, this story should be just as much of a surprise hit. From a cult team to a cult player. Soccer AM-favourite Jimmy Bullard is a cockney geezer with a smile on his face and stories to tell. At 20, he swapped painting and decorating for professional football, working his way up to the Premier League with surprise package Wigan Athletic, before spells at Fulham and Hull. All-action and larger-than-life, Bullard is guaranteed entertainment. I wonder if Nick Barmby gets a mention? James ‘The Indiana Jones of soccer writing’ Montague received widespread acclaim for When Friday Comes, his 2009 book on football in the Middle East during the Arab Spring (When Friday Comes). Since then, he’s been travelling the globe, following the (mis)fortunes of international minnows attempting to qualify for the 2014 World Cup in Brazil. A funny and insightful exploration of a whole lot more than sport. This first ever biography of one of British football’s fiercest competitors should be an absolute treat. To date, Ferguson’s footballing legacy is unequivocally negative; the most red cards in Premier League history and the first professional footballer jailed for an offence committed on the pitch. And yet, ‘Big Dunc’ is also still the Premier League’s highest ever scoring Scot, a classic target man who combined aerial prowess with genuine skill. A talent deserving of examination, then. I’m not sure publishing has ever seen anything quite like it; a bitterly controversial footballing icon teaming up with a Booker Prize-winning novelist. The second instalment of Keane’s autobiography, provisionally titled ‘The Second Half’, promises to be every bit as fascinating as the first. Said to blend ‘memoir and motivational writing’, it’s sure to include a response to Sir Alex’s recent comments.